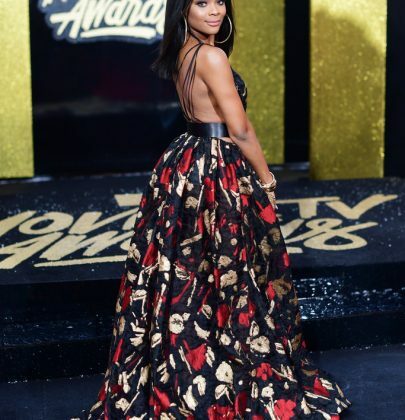 I thought I had seen all the looks from the #MTVAwards and I was just about to put my laptop away when I spotted Ajiona Alexus; resplendent in a dramatic Fernando Alberto Atelier floral jacquard gown. This is beyond dreamy. She just stole the event in my opinion. Best look of the night hands down. She looks like a princess. The subtle makeup and hair allow for the dramatic to take centre stage. Well played Ajiona. I love it! Jourdan Dunn in looked smoking in a Johanna Ortiz Fall 2017 floral silky bordeaux get up at the MTV Awards. The outfit was made up of a ruffle one shoulder top aptly worn with pink floral trousers. Her look was complemented by a matching wine lip and a sleek curly pony tail. I love this. How does she always look so good!Her skin is glistening against that wine top. I want this look now. One thing I love about Cara Delevingne is her style options are never average. She loves to push boundaries. And for that, I usually look forward to her red carpet appearances. She was clad in an embellished LBD from Saint Laurent Fall 2017 collection complete with over the knee boots and a vampy lip. 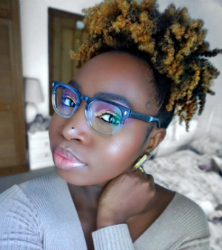 She had her hair shaved off for a movie role and it looks absolutely haute on her! The sheer trend may have been overdone, but if anyone is allowed to show up and show out in a sheer, high slit dress, it should be a supermodel. Case in point, Jasmine Tookes at the 2017 MTV Movie & TV Awards is all legs. Her gams go on for days. I mean if I had legs like that. they’s ALWAYS be on display. Her Lethicia Bronstein blue lace dress was okay. I mean she could have literally worn anything. This woman is a stunner. I do love the colour of this delicate dress on her skin. The only thing I don’t like about this look is the oversize patent leather belt. I wish it had bit more character to it. Issa Rae looked stinking gorgeous at the 2017 MTV Movie & TV Awards in an Off-White leather cami dress. The very girly midi dress features frills around the bra and a part pleated skirt with an asymmetric hem line. Issa always look beautiful at events and her looks are always so appropriate. I love this. Do you?